Samana is a 150 nautical mile sail from Luperon (taking upwind tacks into account). Seems doable but this trip along a coast with several windy capes and high cliffs sailing directly into the strong and steady trade winds is a task that requires some planning and patience. Going was slow requiring frequent short tacks along the coast to minimize the currents and play the lees along the shore. We kept our eyes peeled for whales as we rounded the Cabo Cabron and sailed around into the Bahia Samana and were rewarded by some great breeching action in the distance. This is their mating ground and apparently they are incredibly active and playful during their visit here. Feeling in need of a little extra comfort and some water and provisions we checked into newly opened Puerto Bahia marina with a gentle sigh of relief. What fabulous luxury! The marina is part of a huge (but very tasteful) resort with all of the amenities. Six swimming pools, fast internet and a beautiful lobby with a bar right in front of our boat. Fortunately the place had only been open for a month and their prices for boats were under 1$US per foot. The hotel has a very chic travel agency whom we approached to help us to rent a car. On the first occasion we were told to meet in the lobby of the hotel at 0900 to pick up the car. We showed up promptly at 0900 with our hair in a braid (well Emma’s anyway) only to be told that the car was no longer available. And we had already paid! They offered to compensate us with a chauffeured taxi for the day (a much more expensive option which they offered for the same price) and couldn’t understand that we were not entirely happy. The taxi chauffeur took us to the major sites in the areas and we found ourselves back on the beaten path. This path involved (among other things) riding an emaciated donkey for 45 minutes to a beautiful waterfall. Unfortunately, we were swimming in the waterfall with several hundred cruise ship passengers. Aaaah, we have become spoiled. Our second car rental from Samana was also slightly ridiculous. They brought us an extremely old jeep with no seatbelts in the back and no window coverings. Fortunately, we had some big adjustable sail ties that we able to rig to fix Emma and Macsen’s car seats safely in place. Having personal control of the car was more enjoyable as it gave us the opportunity to stop where we wanted and visit small villages along the way. Once again we were visiting a country with extremely lavish luxurious possibilities on one side of the resort gates and extreme poverty and necessary self sufficiency on the other. Once again, more than a little disturbing. On February 3rd we took the boat 12 nautical miles across the bay to anchor in the Park de Los Haitises. Stunning! This park is said to rival Bora Bora in natural beauty and although I cannot tell from experience I can well imagine this to be so. Gentle hills surround the anchorage and there are beautiful walks through the humid subtropical park forest. There is little road access and the number of tourists per year is strictly limited. The hills are pocketed by caves created by water erosion and there are miles of dinghy exploration possible through the mangroves. The Native American Taínos adorned several of these caves with pictographs and petro glyphs. Pelicans, ibis, frigate birds among others are constantly soaring overhead. And to top it off there is a beautiful ecolodge with a cascade of natural fresh water pools to swim through. Ahhhh! After a few days of pure beautiful nature we returned to the Puerto Bahia resort to watch the US football Super Bowl 2011. 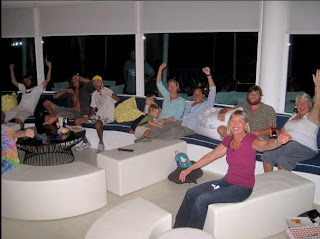 There were six other boats (s/v I Don’t Neaux, s/v Eclipse, s/v R Sea Cat, s/v Yolo, s/v Hajera, s/v At Last) with a lovely group of people and together we made up quite a lively party. Emma and Macsen still sometimes shout a random “Go Packers!” for the winning team so they obviously learned something from this experience as well. The sail to Luperon, Dominican Republic was as long and unpleasant as expected. We were motor sailing for 3 days into 15 knot winds with 2 meter seas and a little current against us. A slow and incredibly frustrating process taking us down to under 4 knots over ground for hours on end at full throttle with the engine gulping through our diesel. Ugh! Luperon is a beautiful harbor surrounded by lush green hills and absolutely full of cruising boats, many with huge beards underwater indicating that they have been sitting there for a while. We had received many many warnings about the time consuming check-in process in Luperon involving corrupt officials coming on board and asking aggressively for ‘presents’ . Several people gave us advice on how to protect ourselves from this threat and respond to these horrible and forceful requests. Upon arrival, we hoisted the quarantine flag and Seb proactively jumped in the dingy to hunt down the numerous officials that needed to be informed of our arrival. Within 1 ½ hours (relatively short for this kind of thing) he came back to the dingy with two men, one from agriculture and another from customs. They opened a couple of cupboards and peeked with a giggle at Emma and Macsen while we chatted in Spanglish to the best of our collective abilities and they left with a smile after about 15 minutes. Their only request was for a cold drink. Sadly our knowledge of Luperon remains limited to a quick glimpse of the busy village streets as the relatively good weather and our schedule forced us pull up the anchor the following morning. It looked like a lovely place to explore. Our plan was to spend a couple of hours in the morning getting diesel and picking up our despacho (departure documents required to for any movement in DR) and then leave around 1000ish. We were startled awake by loud knocking (rather shocking) on the boat before 0700! Two overzealous but very friendly customs and immigration agents had taken it upon themselves to bring us our despacho in person. They had ridden out in the dinghy of another departing cruiser and Seb rowed them back to the dock once the document changed hands. For this special delivery service we thanked them and offered a cold drink. They gave absolutely no indication that they wanted or expected anything more.